Thirty-three Club members set out yesterday morning on the MMC Christmas Bus Meet, destination, ‘the Fannichs’. 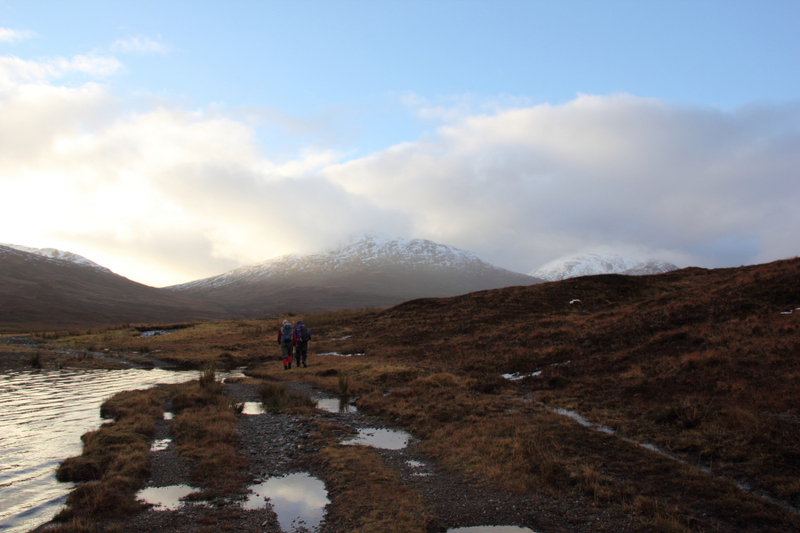 Members were dropped-off at various points en-route to the Loch a’Bhraoin parking area, where the bus parked-up for the day. 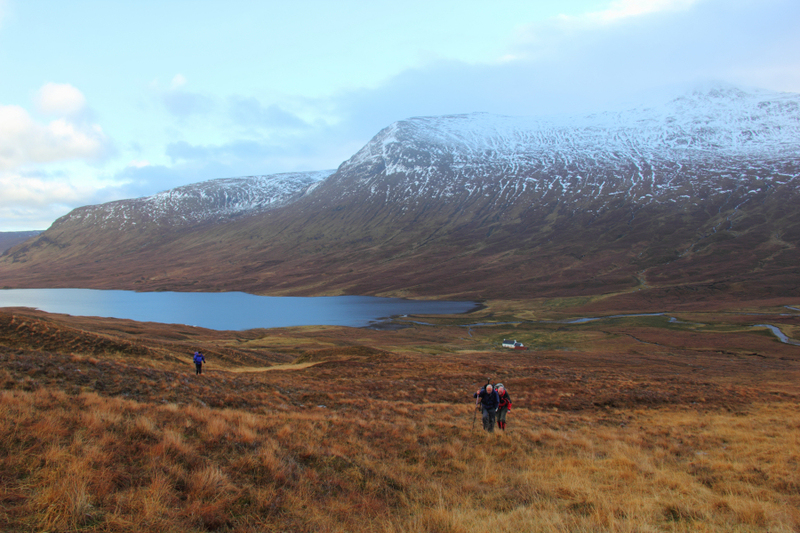 Fifteen members disembarked at the start of the Loch a’Bhraoin track all making for Lochivroan bothy, some with the intention of continuing on to summit Creag Rainich. 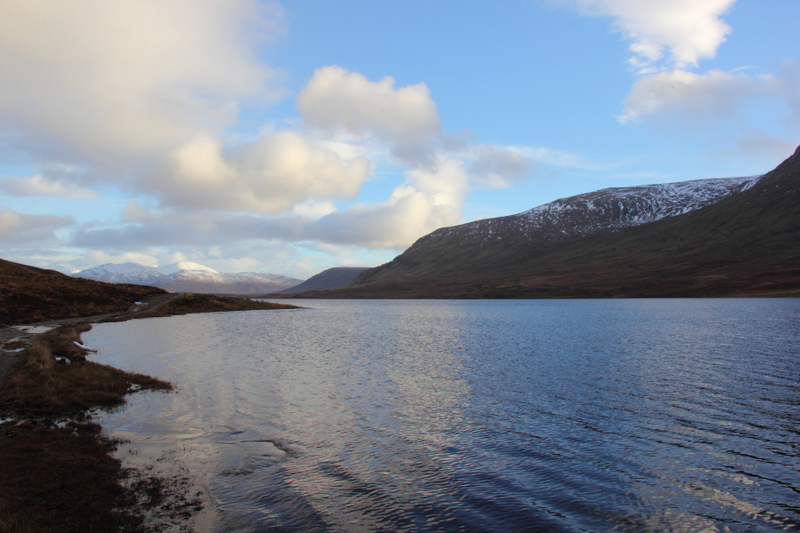 The group of fifteen pretty-much walked together as far as the East-end of Loch a’Bhraoin. 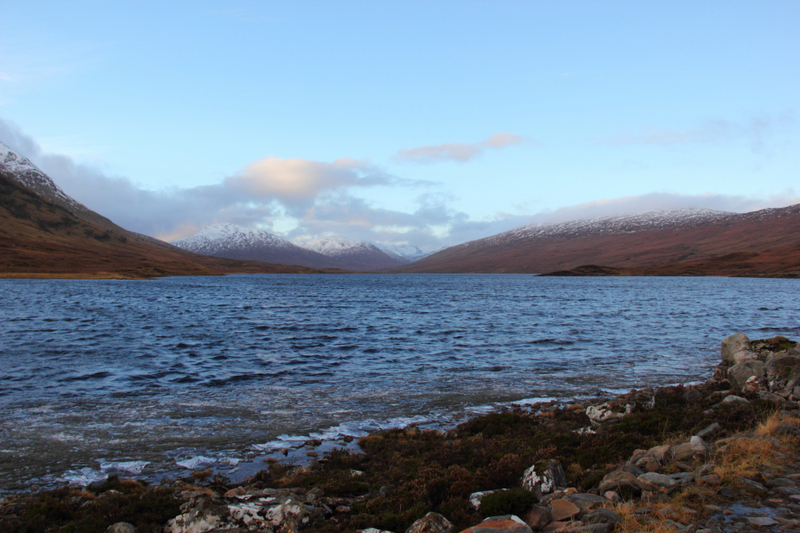 On reaching Loch a’Bhraoin, I stopped to take a few photos of the loch looking towards Groban and Beinn Bheag in the distance. 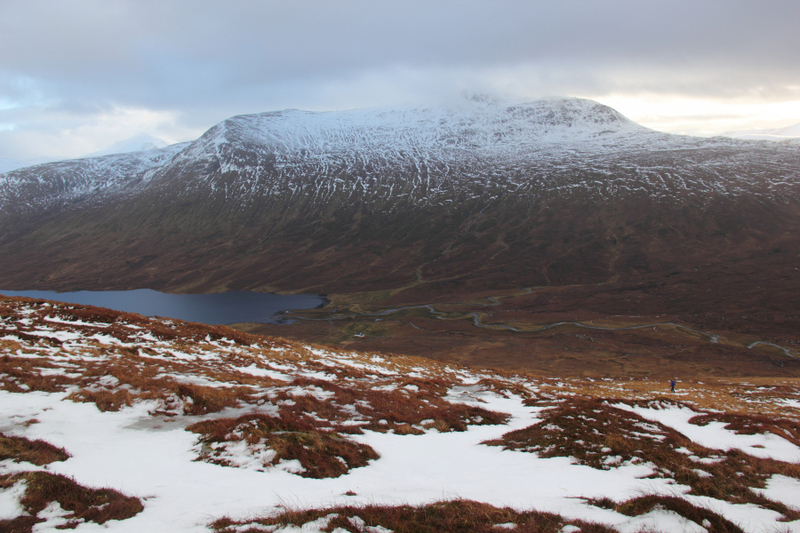 On reaching the track next to Loch a’Bhraoin, Ray and Bill set the pace of the day, a pace somewhere between that of a mountain hare and a snow leopard. I just about managed to keep up . 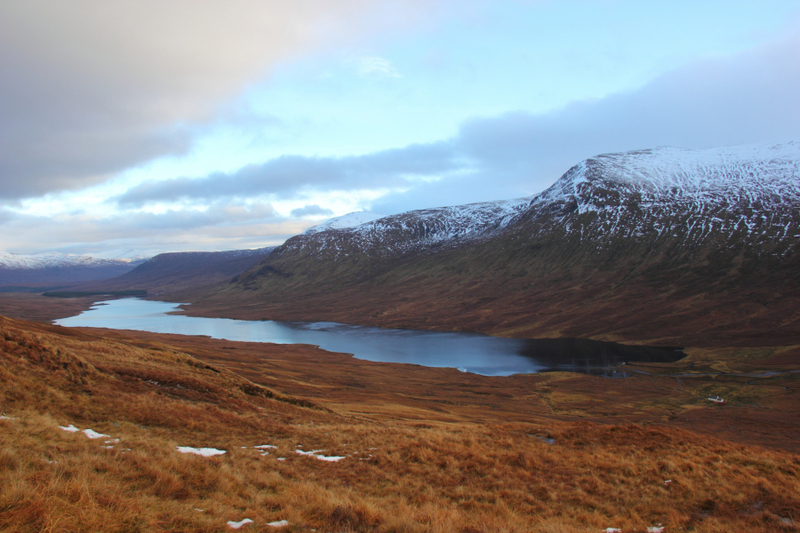 As we progressed along the loch-side, I could feel hot spots developing on my heels and the start of a blister. 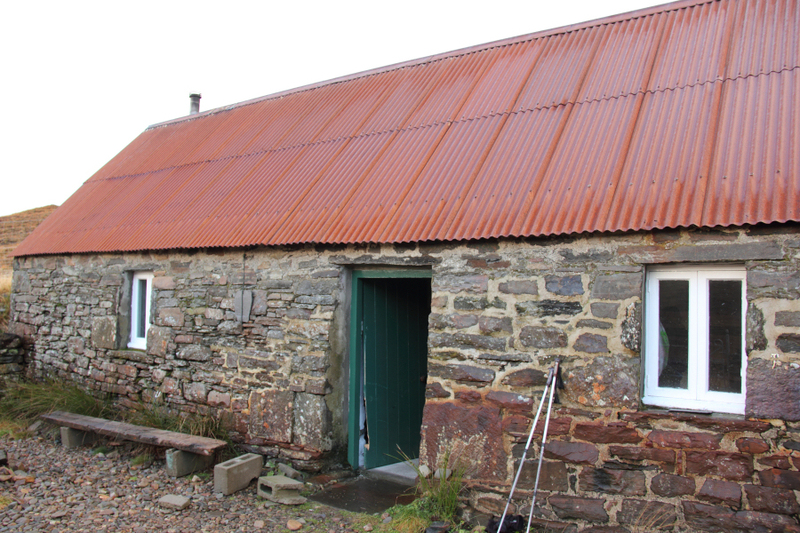 On my previous ascent of Creag Rainich, I took to the hillside before reaching Lochivraon bothy, so this was my first visit to this nice bothy. 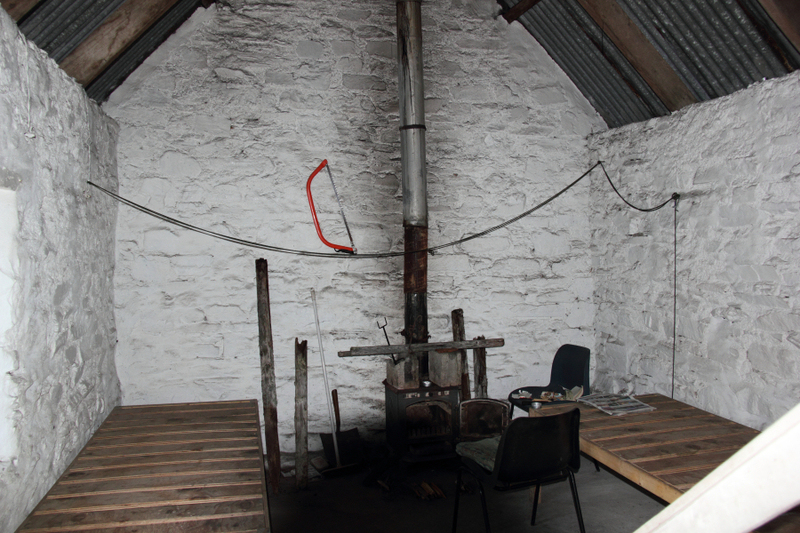 Myself, Ray and Bill reached Lochivraon bothy five to ten minutes before the remainder of the group. This provided sufficient time for me to put on some Compeed and have a hot drink and bite to eat. 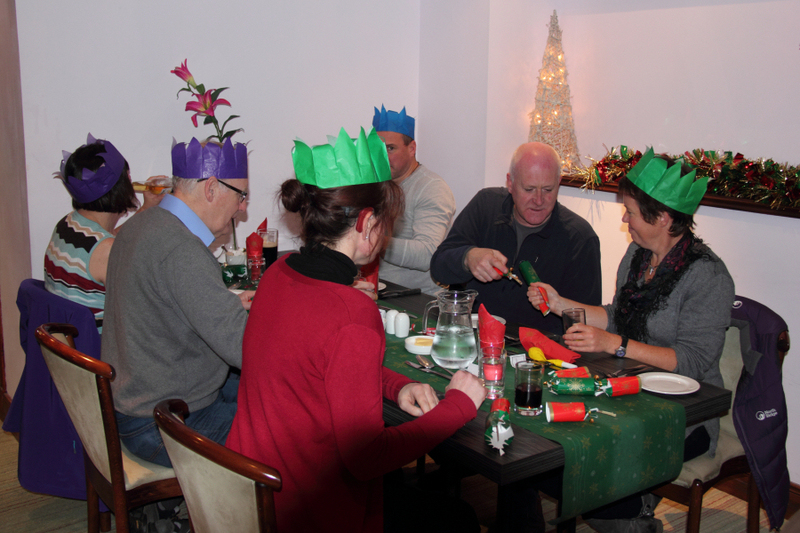 The group soon got the fire going and Corinne passed round mince pies and caramel shortbread. Superb! 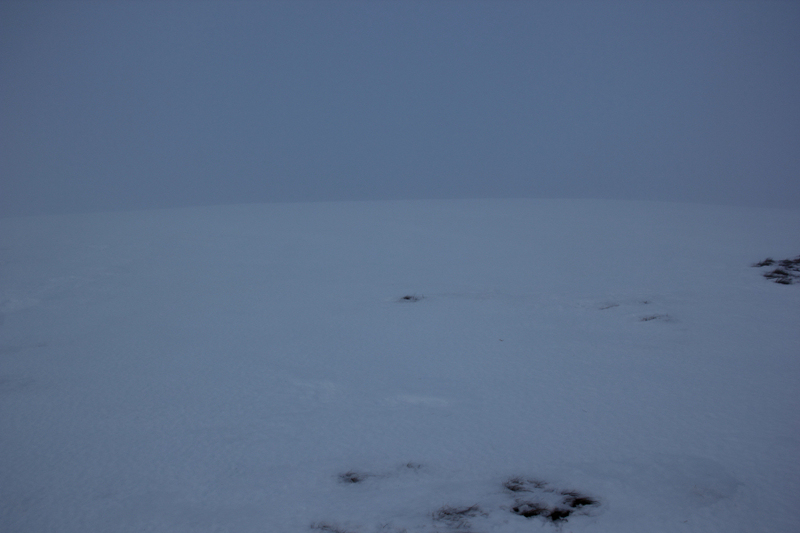 As nice as it was in the bothy, time was really not on our side if we wanted to reach the summit of Creag Rainich. We only had a total of 5Hrs 45Mins walking time before our coach would be departing to take us for our Christmas meal. 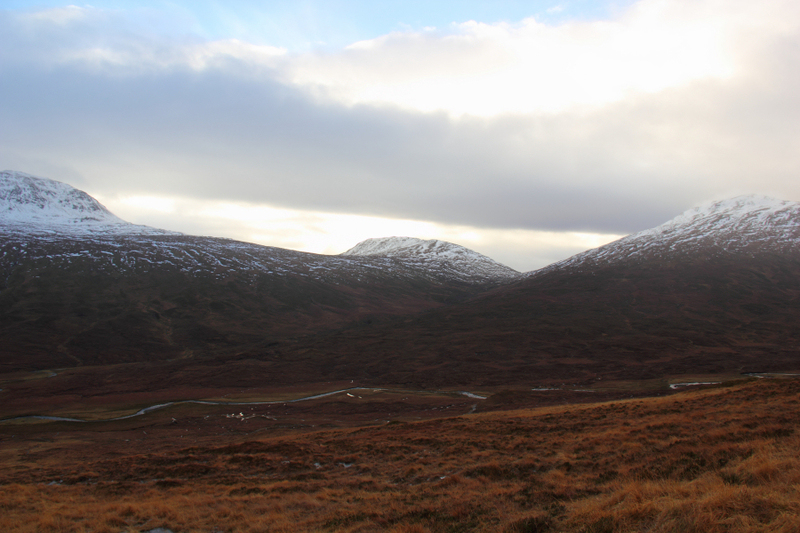 I set off from the bothy followed by Graham, Ray, Bill and Malcolm. 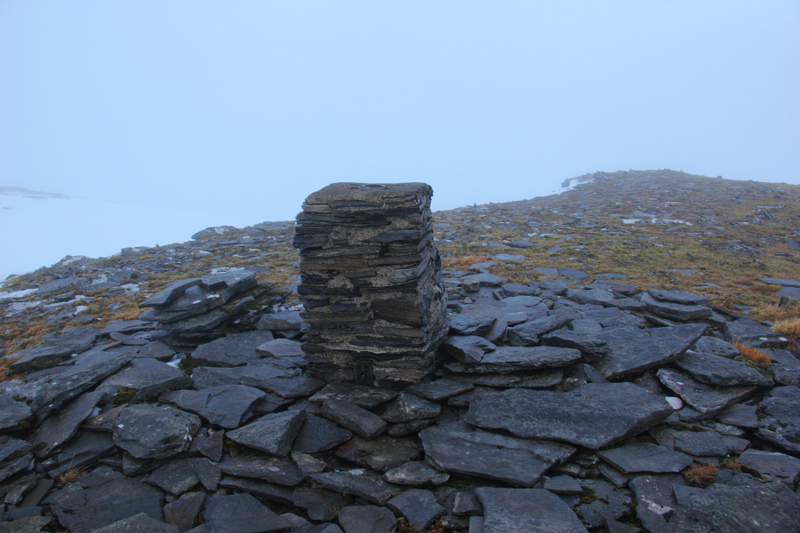 The first few hundred metres of ascent were straight-forward as there was no snow. 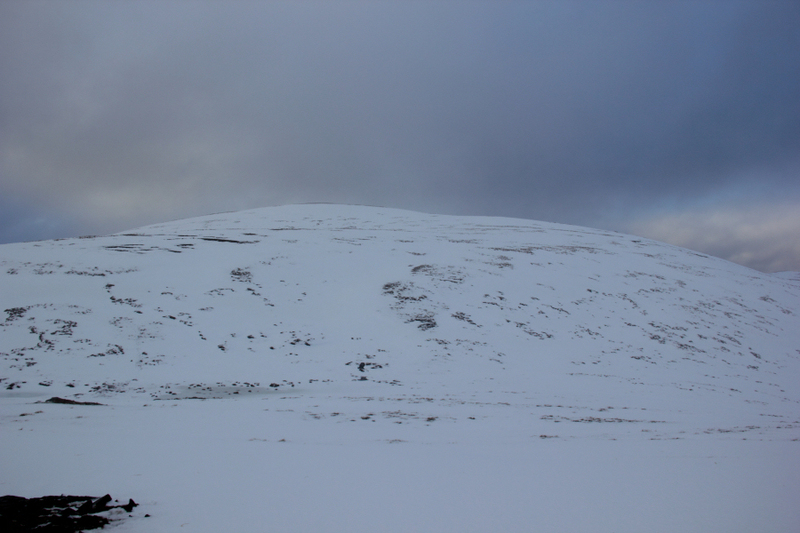 During the next couple of hundred metres, I tried to weave a path up the hill avoiding all the snow patches. 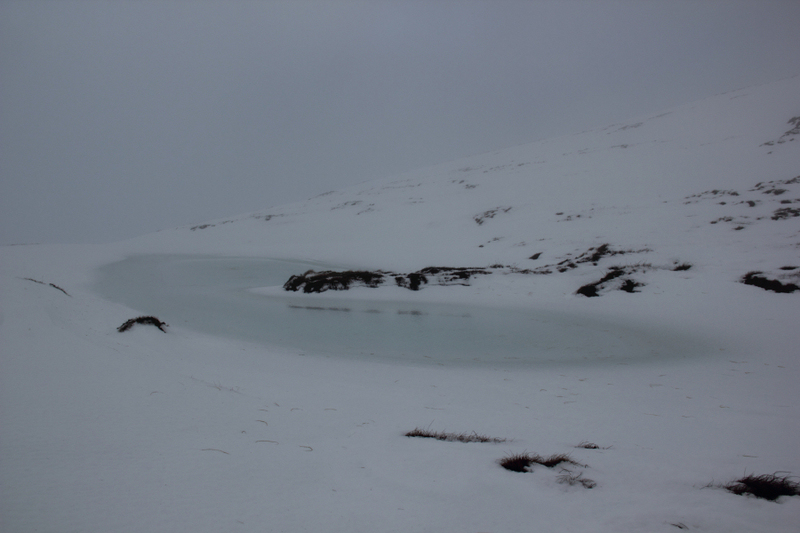 The snow was unavoidable in the final couple of hundred metres ascent as we made our way towards Meall Dubh and beyond to Creag Rainich. 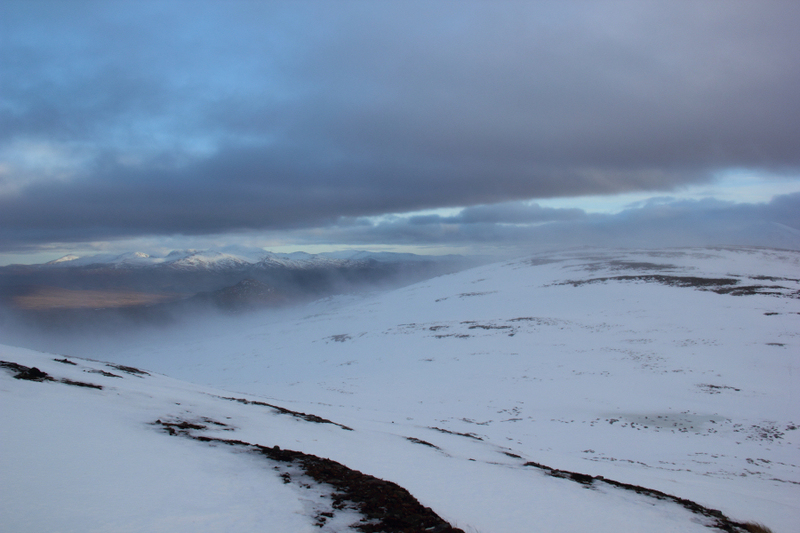 On reaching the summit of Meall Dubh, which was in cloud, I had a quick look at Viewranger on my phone to confirm both our position and the direction to the summit. 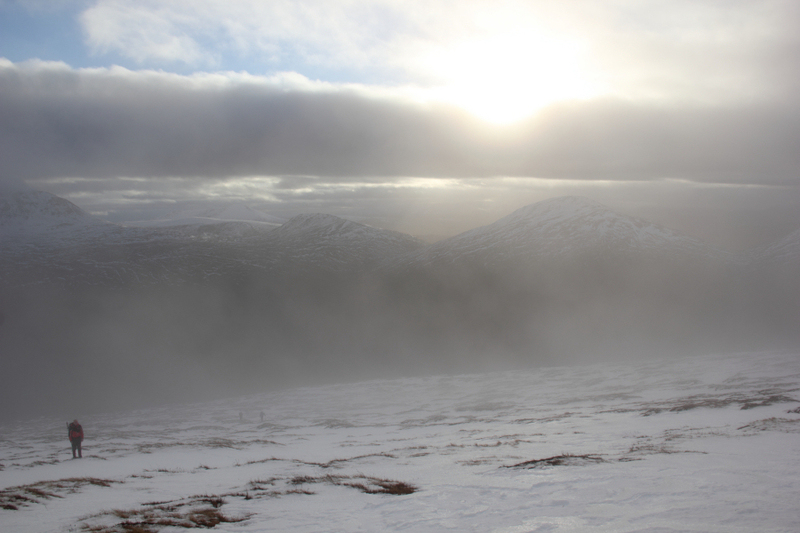 From Meall Dubh, we made our way down to the col before ascending the final snow-covered section to the summit of Creag Rainich. I found breaking trail up this final section a bit tiring. The snow was a mix of soft and hard with the odd drift to sink into. 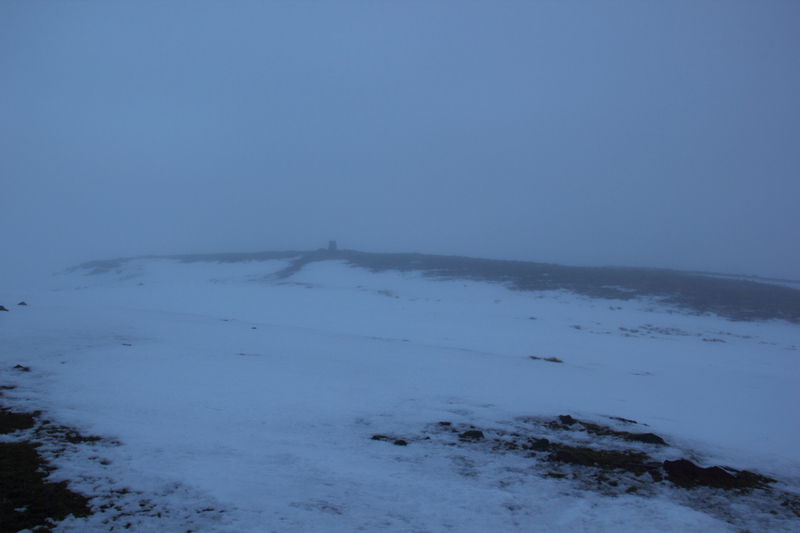 Myself and Graham reached the trig point and then continued on to the actual summit a short distance beyond. I have included a photo from my previous ascent of this hill from July 2007. 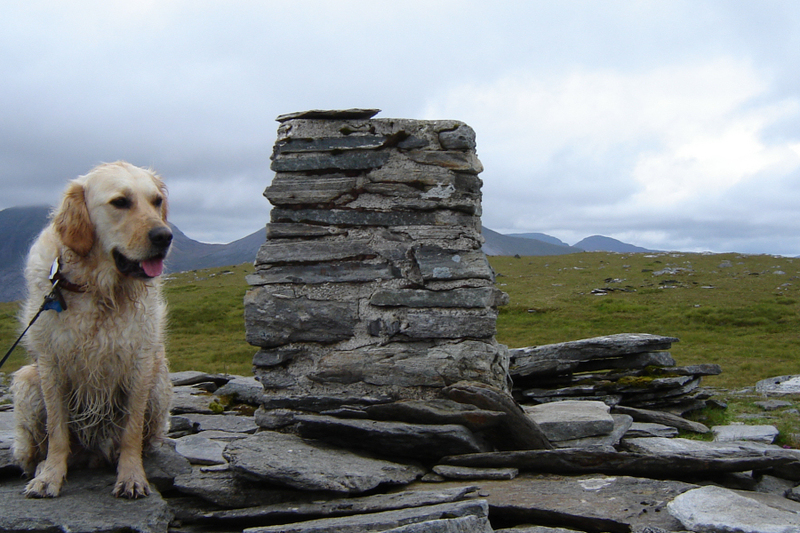 On returning to the trig point, we waited a minute or so for Bill, Ray and Malcolm to also reach the true summit. We all knew that we had no time to spare, so there was no food or drink stop at the summit, it was simply a case of head back the way we had came. 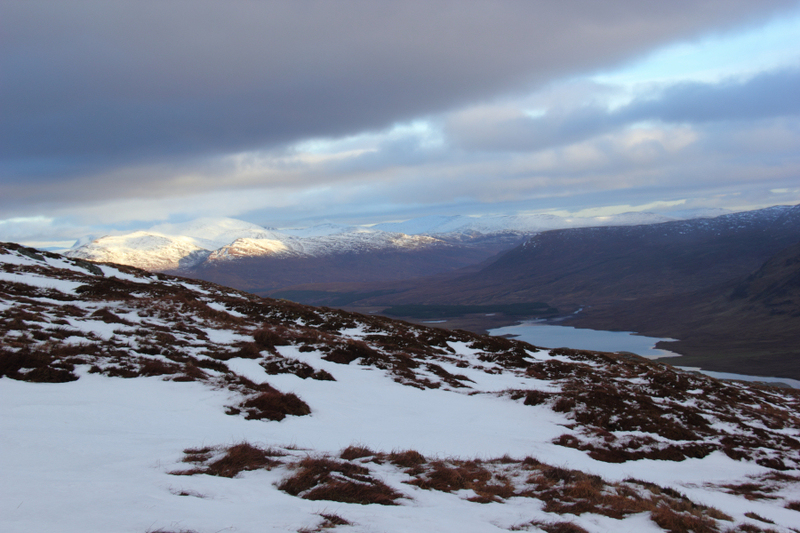 During the descent, we got some nice views across to the Beinn Dearg range. 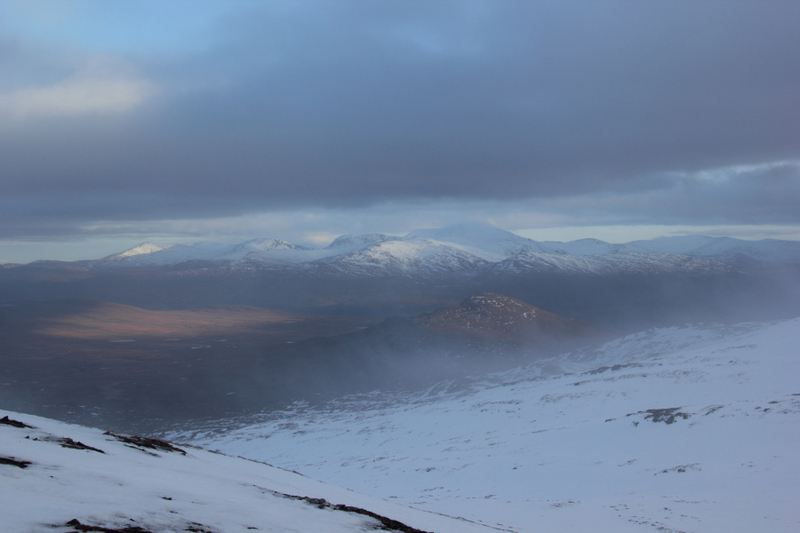 Once back at the top of Meall Dubh, the cloud also lifted sufficiently to get a view back to Creag Rainich. 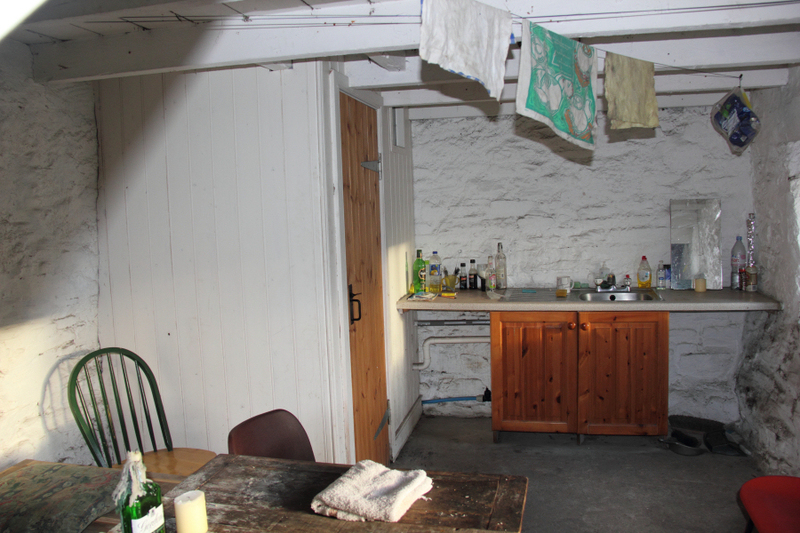 During the descent, I upped my pace in order to have a few minutes time back in the bothy to eat my sandwiches and have a drink. 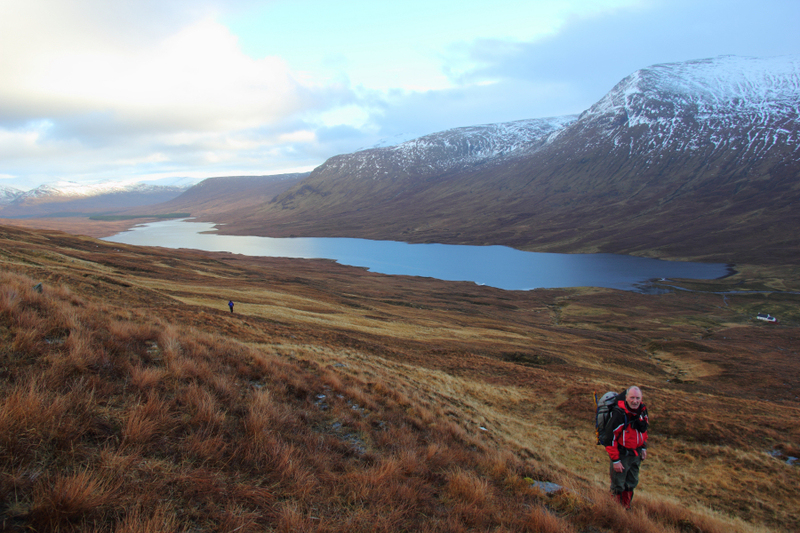 The walk out alongside Loch a’Bhraoin was again fast. Bill shot off ahead like a rocket. 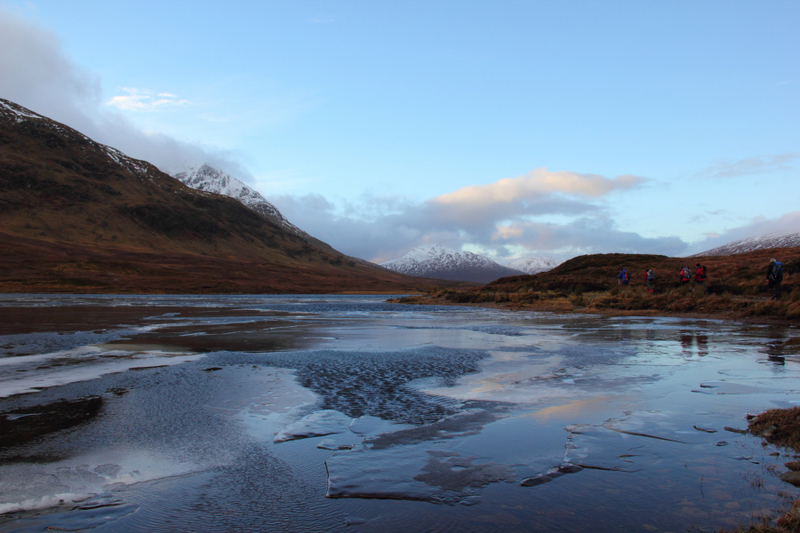 I only stopped once for photos during the walk back along the loch. 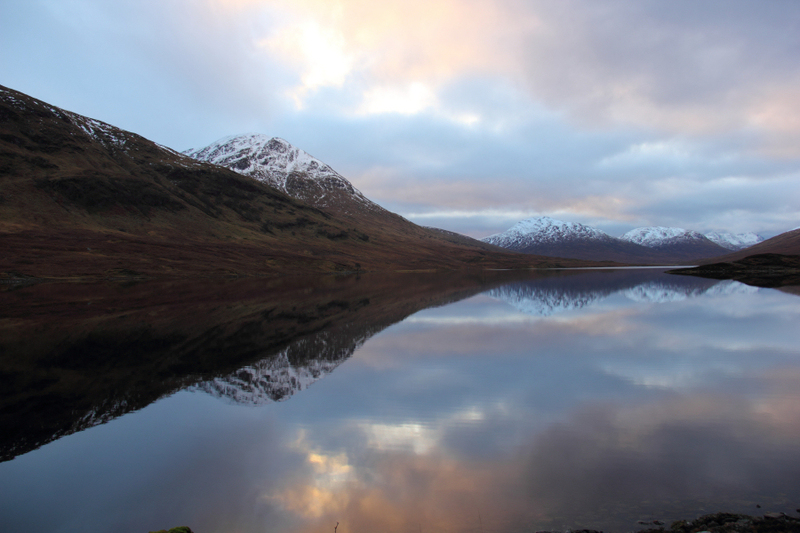 The reflections on the loch were too good to miss. We all made it back to the bus with around ten minutes to spare – great timing . 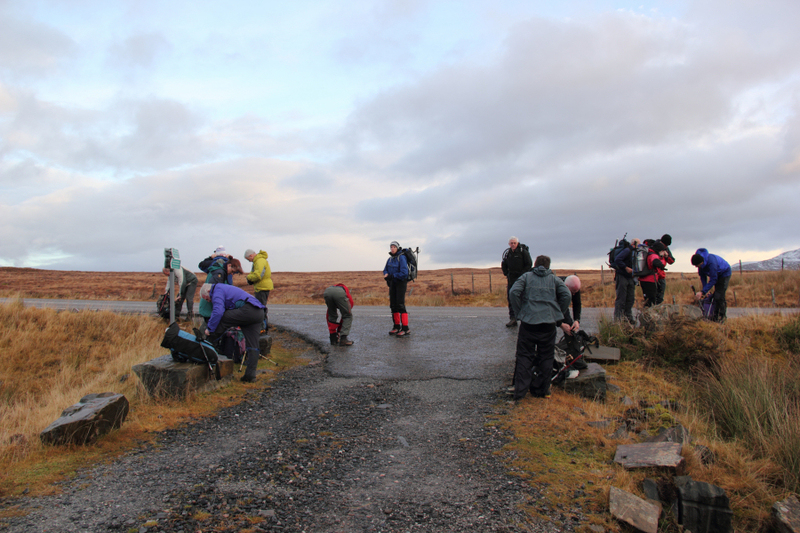 The bus then departed, picking up other members who’s walks finished at the Aultguish Inn and the Inchbae Lodge, which to their disappointment were closed. 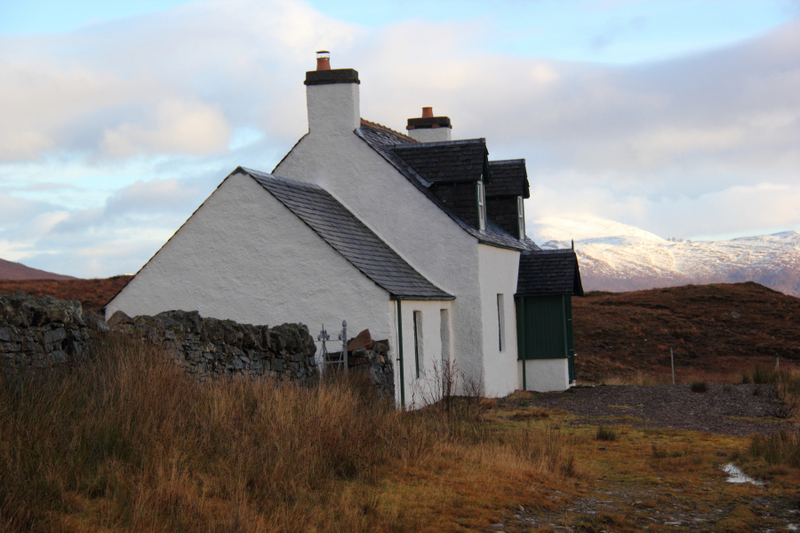 Great Highland Hospitality – Aultguish Inn – “Gone Skiing” apparently. 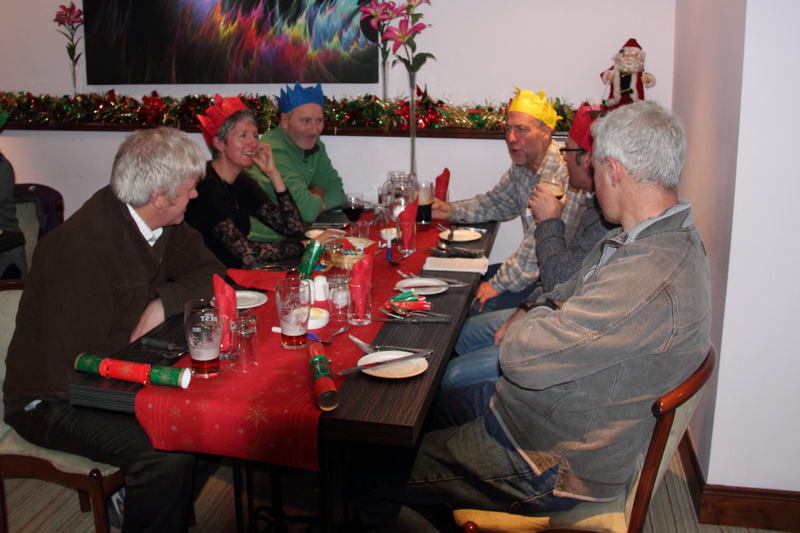 Finally, we stopped at the Priory Hotel in Beauly for our Christmas Meal. 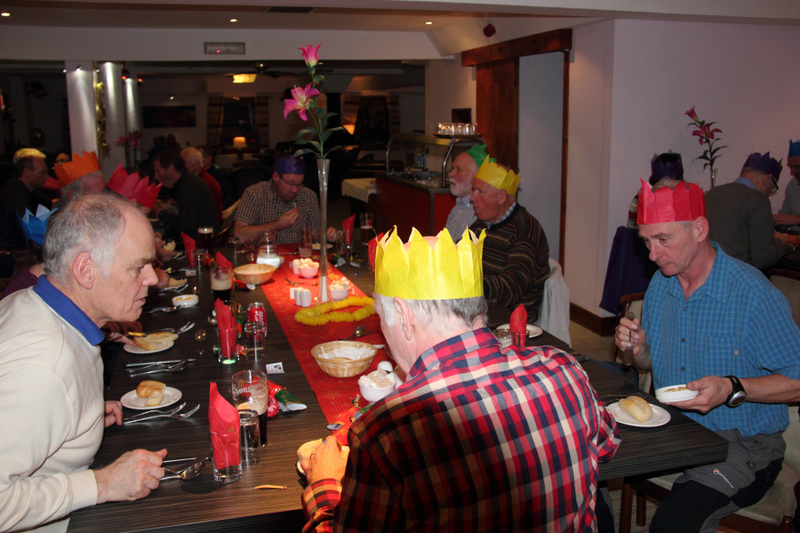 A superb meal that I could not fault in anyway – delicious! 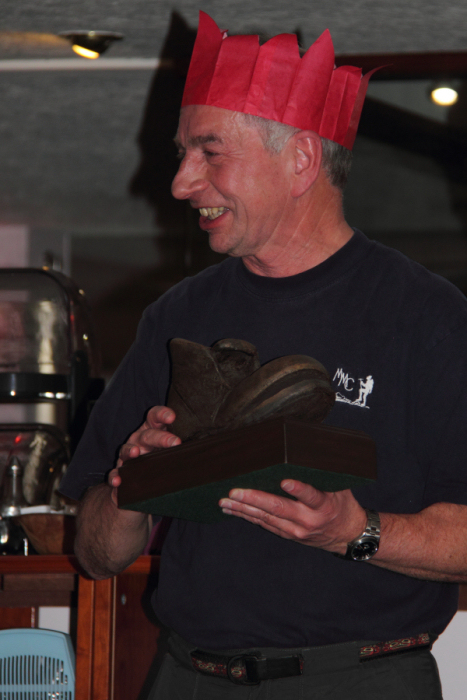 We had circa 3.5hrs at the Priory Hotel during which time plenty drinks were consumed, tales were told and Drummond was awarded, “the boot”. Something to do with Drummond being a “time lord”, or “master of time”, I think. However, I think Jake himself was missing from the nominations for his, "Full moon over the In Pin" . A really great day out. 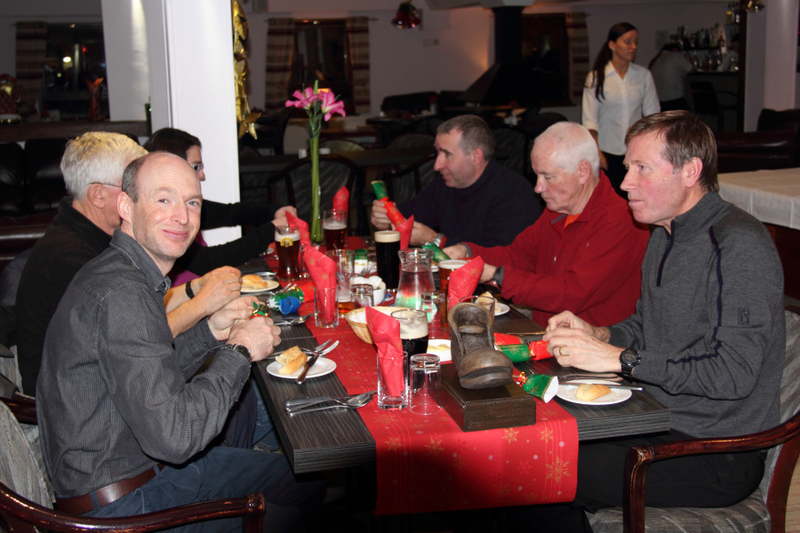 Thanks to Dave for organising the Bus and Graham for organising the superb meal .